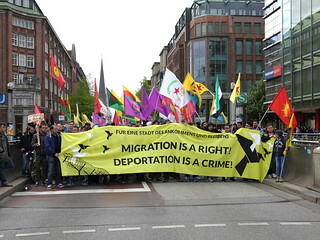 2000 people took to the streets in order to express their protest over inhumane deportations of refugees and in support of a city of arrival, social rights and humanity. Hamburg, January 2016: In the middle of the night police officers arrive on the site of an accommodation for refugees in Kiwittsmoor, surround one of the houses and storm the apartment of a peacefully sleeping family from Afghanistan at 4am. The family, the wife being heavily pregnant, is about to be deported to Hungary, a country that does not respect the international and EU standards of asylum, human rights and detention. Moreover, since the building of the wall along its Serbian border, access to asylum in Hungary has become virtually impossible. Hamburg, February 2016: The Golden Pudel Club is burnt down. Our neighbor Kofi, a refugee from Lampedusa in Hamburg that lives next to the Club and is an important witness of the crime is taken into deportation custody and then deported to Italy in March, where he will not be able to access state support. Hamburg 2015 and 2016: Roma and Romnija that are discriminated against for racist reasons in their home countries and are deprived of essential rights like housing, education or water supply are stigmatized as „economic refugees“ and are deported into misery. With the rise of right-wing agitation and propaganda by Pegida and AfD, the ruling parties in Germany have more and more switched their policies towards sealing-off borders, deporting migrants and restricting basic human rights. People that have been forced to flee are marked as „problem“ that has to be „solved“. After the collapse of the so called Dublin-System, new mechanisms to push back, deport and restrict the mobility of migrants and refugees have been installed at the borders of Europe; beyond the re-emergence of fences and walls, and a renewed militarization of Europe, the EU-Turkey deal currently allows to deport back to Turkey all those who arrive to Greece, without subjecting them to a proper asylum procedure and preventing them from making their way into Europe. In Germany, the recent tightening of the asylum law has laid the legal foundation for a more drastic deportation policy. The government doesn’t hesitate to declare more and more countries as „safe“ – despite documented persecution of minorities, marginalization or war and increase the cooperation which countries such as Afghanistan in order to more easily deport asylum seekers originating from there. Moreover, with the new law, deportations do not need to be communicated previously to deportees; and asylum seekers on fast-track will be hosted in closed accommodation centres not accessible to activist or lawyers. The SPD/Green senate in Hamburg also shows its inhuman side in this respect. The number of deportations has increased in Hamburg from 1.304 (2014) to 2.160 (2015), with 712 of these being deportations under the use of force. Every third person that is deported is still a child and going to school! Many more people are threatened with deportation, which means that they have to live in constant fear of being caught while sleeping by the police because their right to stay has expired or has been rejected by some bureaucrats. Deportation – what does this word mean? Deportations tear apart families, deportations alienate people from their social environment, deportations force people back into the situations for which they migrated in the first place… A deportation is the practical and violent deprivation of freedom and of freedom of movement, of the right to the city and the right to stay. To make the deportation machinery more effective the senate of Hamburg is now also planning the construction of a prison with up to 20 places at the airport. In this center for „detention pending deportation“, people are supposed to be imprisoned for a few days before they are deported into misery. The unspeakable tradition of treating refugees and migrants as criminals will again thrive and be strengthened. But Hamburg – like many other cities – has already shown a different face. Not only concerning the large migration movement last summer, Hamburg has proven to be a city of Welcome and Solidarity, of practiced readiness to help and of humanity in everyday life. New Hamburger citizens have resisted being deprived of their basic rights: Lampedusa in Hamburg, who are fighting for the right to stay, working permits and basic rights since 2013, Roma and Romnija that have occupied the St. Michael church in September 2015, and many more. Especially school students have repeatedly drawn the attention to the organised inhumanity of deportations and have campaigned for their threatened classmates – for Fabiola, Ayodele, Jia Li and Jia Ru, Amad and Seherezada. Resistance to deportation is already in place, let’s put our efforts together! Let’s transform the everyday solidarity into a loud movement that opposes both the violent deportation policy of the senate, as well as the anti-immigrant actions of the residents of some districts, and let’s campaign for a Hamburg for everyone! Hamburg 2020: a Hamburg that welcomes all migrants and refugees and provides shelter for those seeking protection. A Hamburg in which thousands don’t have to disappear into illegality because of their fear of the authorities’ violence. A Hamburg, in which social and political rights hold independently of a coincidentally gained nationality. Let’s organize, take action and fight for a city of arrival and stay, a city of social rights for everyone. Stop the nightly attacks on innocent citizens! Stop deportations! Right to the city means right to stay!